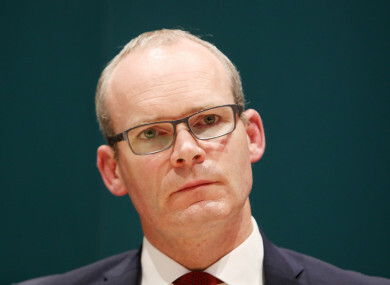 TÁNAISTE AND MINISTER for Foreign Affairs Simon Coveney has said the separation of children from parents at US borders is “indefensible, immoral and shocking”. “This kind of leadership gives licence to other countries to follow inhumane policies towards vulnerable refugees. Is this making America great?” Coveney said in a tweet. US president Donald Trump vowed yesterday that the US would not become a “migrant camp”, as pressure mounted on him globally to end the separation of immigrant families on American’s southern border. While top administration officials stood by Trump’s policy of “zero tolerance” towards unauthorised border crossers and insisted children were being held in humane conditions, criticism swelled from rights groups and within the president’s own Republican Party. Official data shows more than 2,000 children have been separated from their parents or guardians since early May, when the administration said it would arrest and charge all migrants who illegally crossed the Mexican border – even if they were seeking asylum. Labour Party leader Brendan Howlin TD has called on Coveney to raise the issue of children being separated from their parents at US borders directly with the US Secretary of State. “I think people across the world and in the United States are appalled at the implications of this policy, which sees young children being separated from their parents,” Howlin said. US First Lady Melania Trump has said she “hates” to see families separated at the US border and hopes “both sides of the aisle” can reform the nation’s immigration laws. “It is good to hear the First Lady voice her opinions on the issue in stark contrast to the dishonest and disingenuous commentary being offered by the president,” Howlin said. “I’m calling now on our Minister for Foreign Affairs Simon Coveney to raise the issue directly with the US authorities. There is no ambassador in Ireland to be called in, so direct contact with the Secretary of State Mike Pompeo is required. In addition to this obvious and inexcusable cruelty that this policy is imposing on individual families, it is also further tainting the reputation of the United States. “Some in the administration have decided that this cruel policy increases their legislative leverage. This is wrong,” said Republican Senator Ben Sasse, an occasional Trump critic. Amid the outcry, independent investigative news organisation Pro Publica published audio obtained from inside a US Customs and Border Protection facility in which children are heard wailing. Email “'Indefensible, immoral, shocking': Coveney on the separation of children at US borders”. Feedback on “'Indefensible, immoral, shocking': Coveney on the separation of children at US borders”.